Skill and knowledge retention is a major issue and concern in learning and skill acquisition, especially when trained or acquired skills (or knowledge) are needed after long periods of nonuse. 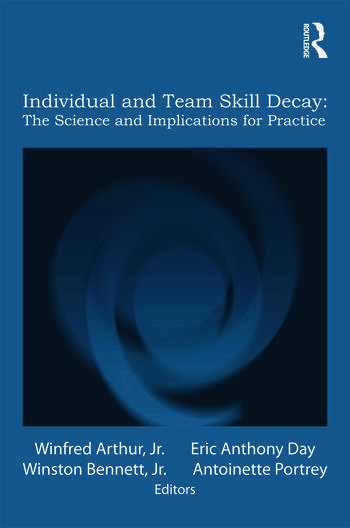 The goal of this book is to summarize and advance the thinking of critical issues related to skill retention and decay in the context of individual and team training on complex tasks. This volume will be of interest to researchers and practitioners in the fields of industrial and organizational psychology, human factors, organizational behavior, and human resources management. Winfred Arthur, Jr. is Full Professor of Psychology and Management at Texas A&M University. He is a Fellow of the Society for Industrial and Organizational Psychology, the Association of Psychological Science, and the American Psychological Association. He is past Associate Editor of the Journal of Applied Psychology and currently serves on its editorial board along with Personnel Psychology, and Industrial and Organizational Psychology: Perspectives on Science and Practice as well. His research interests are in human performance; training development, design, implementation, and evaluation; team selection and training; acquisition and retention of complex skills; testing, selection, and validation; models of job performance; personnel psychology; and meta-analysis. Eric Anthony Day is an Associate Professor of Psychology at the University of Oklahoma where he is part of the Doctoral program in Industrial and Organizational Psychology. His research interests primarily fall in the traditional areas of personnel psychology and human resources management, including personnel assessment, selection, and training and development. Much of his research involves the study of complex skill acquisition with emphases on individual differences, cognitive and social processes, expert–novice differences, decay and adaptability, and team-based training. Winston "Wink" Bennett, Jr. is a Senior Research Psychologist and Technical Advisor for continuous learning and performance assessment research with the Air Force Research Laboratory Human Effectiveness Directorate in Dayton, Ohio. He is a Fellow of the Air Force Research Laboratory and is also a Fellow of the American Psychological Association. He has published over 90 research articles, textbooks, chapters, and technical reports in the Human Factors, Aviation, Industrial and Organizational Psychology literatures. Antoinette M. Portrey is a Senior Scientist with L-3 Communications Link Simulation and Training. She leads her team in warfighter training research at the Air Force Research Laboratory Human Effectiveness Directorate, Warfighter Readiness Research Division in Dayton, Ohio. Her team facilitates the research, design, development, and integration of continuous learning training methodologies and technologies to be used with interactive, multi-fidelity, immersive training environments. Specialty areas include: human performance measurement; individual, team, and unit training effectiveness; training systems assessment; and integrated learning management technologies.